What if your skin was blue and you had no neck, skinny arms and a large flat head? And what if you needed clothing? 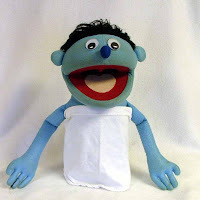 Sometimes knowing how to make people clothes is not much help when it comes to outfitting a puppet! My husband is a puppet master. 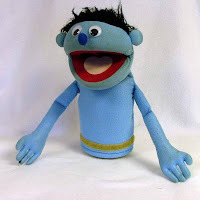 He teaches kids and adults how to make a puppet come alive in a performance. 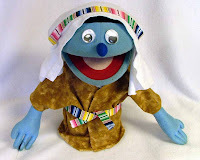 This coming weekend, his puppets will be performing the nativity at our church. He needs 5 shepherd costumes, plus a Mary and a Joseph costume. I went through my stash today to find simple plain colored fabric for the shepherds and some stripes for the sashes. Here is our little blue friend before we started. I cut the sleeves out of an extra large t-shirt to make the "tunic" The fact that he has no neck and will have a coat over the tunic, we don't have to worry about straps. His fuzzy "skin" keeps the t-shirt in place. Next a draped fabric and made a pattern for the coat. The coat has an opening with rounded edges in the front, and self sleeves. To make the sash, I used about 4 inches of cross grain fabric folded in twice, pressed and folded in half. After placing them on him, I then stitched them in place. The head dress is cut from the bottom of the t-shirt and rounded on all edges. The top sash was made the same way and sewn in place. Because they don't have round heads, the head dresses are difficult to stay in place, so tacking is necessary in the back also. Well, he is all finished! Does he look like a shepherd to you? Only 4 more to go! And here is the whole group, add dressed up and ready for their big performance! The back left is Joseph and the front right is Mary. All the rest are shepherds. 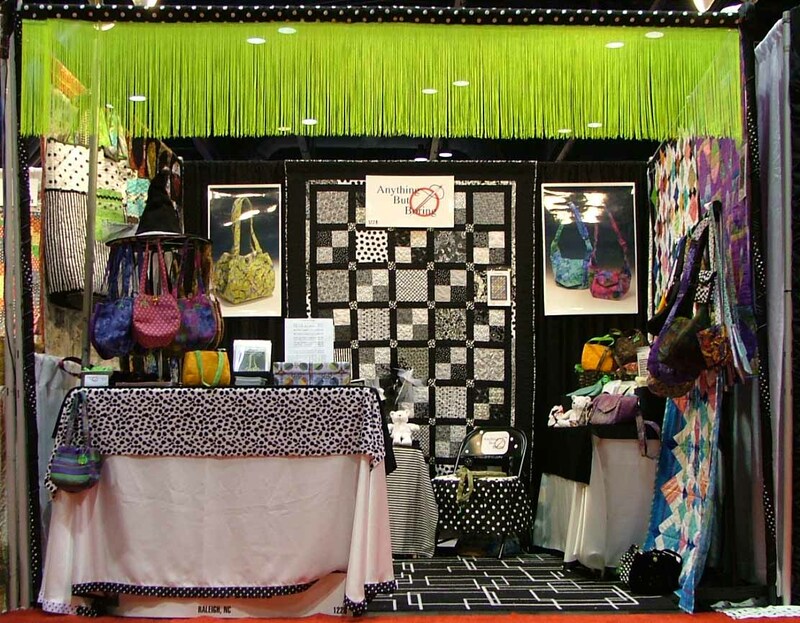 With the help of friends, I was able to drive my booth to market in Houston in October, 2009. 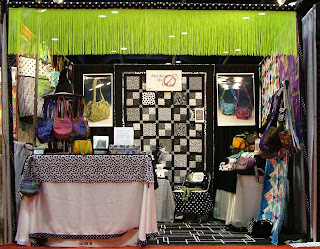 This was my first time to have a booth, though my product had been there the previous two markets. Mary C. was kind enough to ride out there with me and work in the booth the entire time. Sheri S. drove back with me. It was a real treat to visit with Sonja L. in Baton Rouge on the way there and for a weekend on the way back home. We were also able to visit several quilt stores along the way! Some were existing customers, and some became new customers! I have uploaded photos so you can see the booth. Yes, there is 18 inch long NEON green fringe at the top front of the booth! Hard to miss us!